The engineering survey on the Lehigh Canal started in 1818 and construction began on the Lehigh Navigation Canal in 1819 on the Lehigh River at the mouth of the Nesquahoning Creek. The Canal was completed from Easton to Mauch Chunk in 1829. Economically, the canal owed its existence to the discovery of coal in the Mauch Chunk area in 1791 and to the efforts of Josiah White and other entrepreneurs to improve the Lehigh River for shipping anthracite coal. Owned and operated by the Leigh Coal and Navigation Company for more than 100 years, the Lehigh Canal shaped the development of industry and communities along its path. Anthracite coalfields were opened to national markets, and by 1846, shipped more than 2 million tons of anthracite annually; in 1923 it shipped a record 5 million tons of coal. The Lehigh Canal was not only important in the transportation of anthracite coal from the mines of Carbon County to Philadelphia but also had a significant impact on the Lehigh Valley especially in the Allentown-Bethlehem region. The economic impact of the canal can be seen in population growth, industrial and mining development, urbanization and agricultural change and growth. Population growth in the Lehigh Valley increased more rapidly than the rest of the United States from 1800 to 1820 because of the accessibility of the Lehigh River. 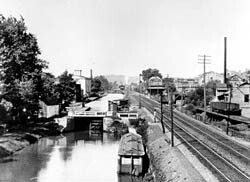 Allentown had a 100 percent increase in population and by 1830 the population increased another 28 percent and, with the completion of the canal, Allentown was ready to become a mature industrial town. Industrially, Allentown benefitted greatly from the canal. In 1830, 303 tons of anthracite moved down the canal and by 1839, the peak year of the canal, 6,638 tons were hauled. As the railroad provided even lower costs after 1870 the canal lost much of its earlier importance. The Great Depression effectively ended the operations of the canal and in 1931 shipping on the canal stopped. Along the length of the canal are the remains of its 76 locks, eight guard locks, 28 dams, six aqueducts, locktenders houses, and canal villages. The general Lehigh River Basin Watershed Area provided the water and the average speed was two to three miles per hour with a two-mule draft. The working day was generally 12 to 16 hours. The Lehigh Canal was divided into two sections. Section 1, the lower canal, ran from Easton to Mauch Chunk (Jim Thorpe) and was 46.5 miles long. Section 2, the upper canal, ran from Mauch Chunk north to White Haven and was 26 miles long. Above White Haven two dam chutes (bear trap locks) were operated from Stoddartsville. The canal was dug 60 feet wide at the top and 45 feet wide at the bottom and was five to six feet deep. Towpaths were eight to 12 feet wide. 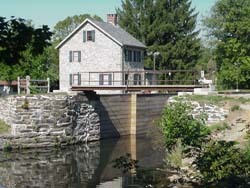 A Visitor Center for the Delaware & Lehigh National Heritage Corridor is located in Easton. It is open Tuesday-Sunday, from 10:00am to 5:00pm. Located on the Delaware River, I-78 and 22 pass Easton, and I-80 passes through Carbon and Luzerne Counties, an hour to the north of Easton. I-81 intersects I-78 an hour's drive to the west. Public Transportation - Amtrak has two stations within the Corridor, one in Bristol and one in Doylestown. There is bus service from Philadelphia and New York City to various communities within the Corridor. Please call the Visitor Center at 610-515-8000 at Two Rivers Landing. While visiting Two Rivers Landing in Easton, plan to visit the Crayola Factory and the National Canal Museum in the same building.